Sept 12 Challenge using EZ Shapes from Whimsy Stamps. This shape is called Cherry cake. It is a cupcake. The file has numerous pieces to use, it has all the different pieces to put together. You can look at this in a couple of ways a flower pot with flowers in it or a cupcake with icing. I just used 2 of the pieces, I cut the bottom of the cupcake then added the top to adhere all the flowers to and the ribbon to look like icing on the top. I never added the cherry piece to it. I think I have enough stuff going on with what I did put on it. I decided to make it a little thank you note card. I never did it to big but just a nice size to give to some one to say thank you. I really enjoyed working with this shape Ez pattern. It's super cute and easy to work with. Also nice that you can re-size them. Whimsy stamps has a huge variety of these cute little shapes that are easy to use. The Design team have created some wonderful cards using these shape EZ patterns. Click here to jump over and check them out. 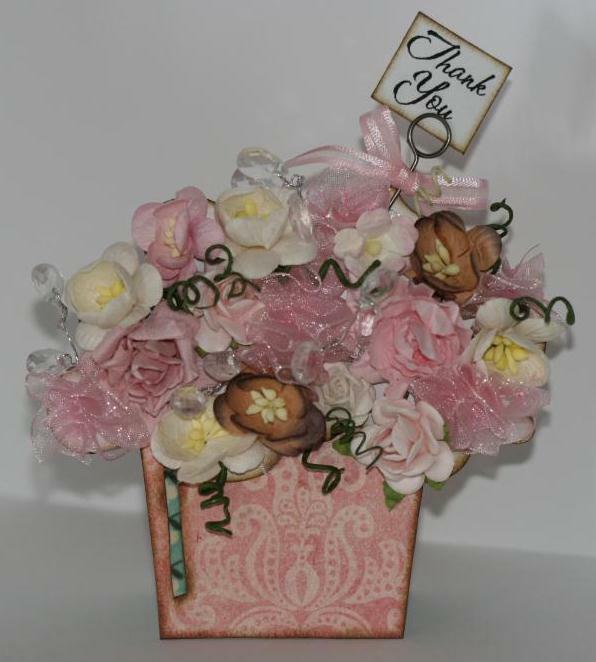 Flowers: Prima marketing, whimsy and Kaiser craft. Embellishments: Tim Holtz memo pins, Clear crystal drops from Whimsy Stamps, Ribbon. Beautiful friend, I like the flowers, and colors you chose! Another master piece! Bang up job!